A baby's first year goes by so fast. They change, grow, and learn so much in such a short time! From their first smiles to their first tooth, from the time they start rolling, sitting, and crawling, to the time they start walking and running. I'd love to photograph some of these memories for you! Baby milestone sessions are available at any age, but I suggest having professional portraits made when your baby is 6-8 months old (a sitter session when they’re sitting without assistance) and one year (a cake smash is optional). Portrait sessions for your baby may be held inside or outside of my location, at your home, or on location in metro Atlanta with Simply Corey Photography. 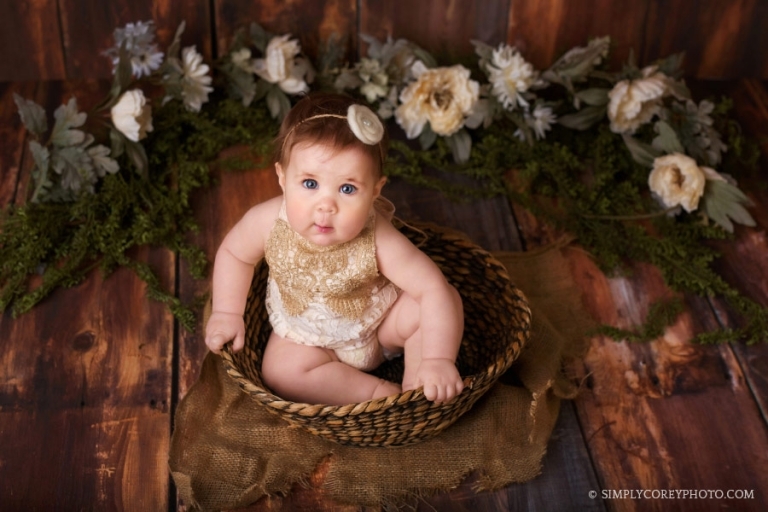 Several baby hats, headbands, outfits, and props are available for studio milestone sessions. More examples of my baby photography sessions can be found on the blog. Would you like more information on a photography session for your baby? Please send me an email to request my availability and detailed pricing!